Pantonic Live! - The CD! Rather abruptly, our Sociology professor asked for an example of a “synergistic collaboration”; silence pervaded the room; that was during my college freshman year. Today, without hesitation, I’d holler “the Pantonic Live CD!”. This musical masterpiece is a product of the joint efforts of: veteran arranger Clive Bradley; the Pantonic Steel Orchestra led by Keith Roberts; and Basement Recordings’ sound crew, directed by distinguished engineer, musician, and educator Trevor John. My discussion of the work reveals a professional bias, in that I (an arranger), dwell largely upon the musical imagination of Clive Bradley, with particular focus on Andre Tanker’s Ben Lion (extended version, track #3). Shadow’s Stranger is imbued with a strong rhythmic drive, the warmth of Caribbean sunshine and the smell of ripe mango. Kudos to the engine room here. The listener’s initial response may be involuntary toe tapping, but his mind is also addressed. I found myself returning to the dramatic opening, where full orchestra seems to spell out “Stra…..n-ger”. Sixteen measures later it’s time for a change in texture; consequently, frontline pans descend over a bass pedal, while the middle section sustains a supporting harmony. Eight measures ensue, and there’s now a need for more spirited activity (excitement! ): A rapid, rising, chromatic run, played in unison, deliberately excludes basses. Why? So that the rapid, descending, diatonic run which follows, will include basses --- thereby providing contrast --- not only in melodic direction, but in weight as well. Another key feature is the ‘breakdown’ in the middle of the piece, introducing dynamic and timbral change, as well as the element of surprise. 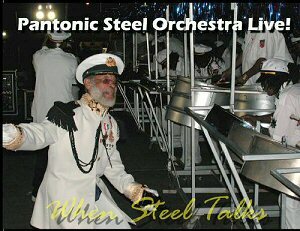 Recording a one-hundred plus piece steel orchestra outdoors, live, poses a challenge which only the most proficient sound engineers are prepared to meet. The New York art community widely acknowledges Trevor John to be among those of his profession who reside on Mount Olympus. The orchestral balance which he and the crew capture on the Pantonic Live CD (most notably Oba’s ‘Picture on my Wall; and In my House), validates this reputation. Bradley’s ‘big-band’ voicings and linear interaction required (especially so on cuts #5 and #6): correct mike placement and recording levels for each section of the orchestra; EQ which would enhance the natural sound of the instruments without distortion; and sensitive, experienced ears. Trevor’s musical background was certainly an asset in this regard. Main and secondary lines --- supporting harmonies—driving percussion --- all are heard in proper perspective. Through insightful interpretation, Pantonic’s performers bring the music to life with spirit and elegance. Their crescendos leading from chorus to verse (and elsewhere), in “In my House”, evince superb dynamic control. The precision and clarity with which complex chromatic sequences are executed; proficiency in changing tone color; alternating between back and front of the stick; ease in moving from lyrical legato to detached staccato (the melody of ‘Picture on my Wall’ for example)-- these skills bespeak countless hours of individual and group practice. They represent a significant element in the formula, which renders Pantonic Live a rare treasure. In today’s world of commercial radio, intelligible musical substance; creativity; and engineering excellence seem (in many cases), to have become disqualifying factors for airplay. I applaud the producers of Pantonic Live in my prediction that radio exposure will be limited to such aware and discerning forums as Basement Recordings website and the Trevor Wilkins show. I’ve tried to keep technical terms at a minimum, but it seemed impossible to dispense with them altogether, and yet convey to the reader some sense of the underlying formal features with which Clive Bradley invested his work; those same features that make us dance, shout, or listen attentively. A further look at Ben Lion (for musicians and sane humans alike): A rising, five-note motive taken from Tanker’s opening, introduces Ben Lion. First appearing in B minor, it establishes the mood of the piece. (In due course, this unit is imitated, transposed, offset contrapuntally, tossed among various sections of the orchestra, and subtly disguised --- never disappearing, however, since even when not sounding, its presence is felt). The first motive is joined by a second --- more lyrical in character --- also from Tanker’s opening. Our main theme (Andre Tanker’s chorus, verse, and refrain melody) is then firmly established in B minor by means of repetition. The 4 pans and cellos, amid contrapuntal interplay with tenors, restate verse, chorus and refrain of the primary theme in D minor. (At the risk of imposing Sonata Allegro form on Ben Lion, I’d venture to call the foregoing an Exposition). All stops are now out. Tanker’s melody is fragmented, transformed, and placed in curious harmonic and modal settings. Freshly created material drawing upon Blues, Salsa and Jazz idioms, reveals the artist’s (Bradley) broad musical experience and vocabulary. So absorbing is the unfolding, we find ourselves in G minor without being sure how we got there! At this juncture one wonders how Bradley will return to the opening key of B minor after having ventured so far a field. Well he doesn’t, and we come to realize that it was never his intention to do so. The two introductory motives are restated (in G minor instead of B minor; a ‘G’ minor roll ends the piece; and we are left with images of Clive Bradley smiling, “Gotcha!"